Discover a world of possibilities when staying at Orlando World Center Marriott. Whether booking accommodations for your family vacation, wedding guests or corporate event, find everything you need for a successful stay. As one of the most convenient resorts in Orlando, we offer amazing on-site amenities as well as a shuttle service to Walt Disney World . 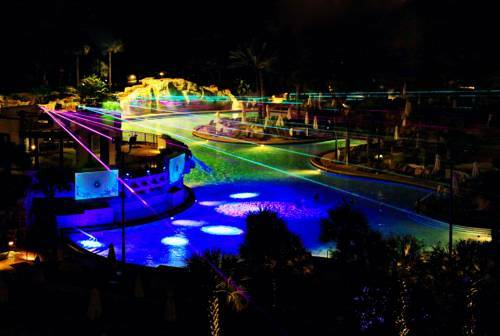 Stop by Falls Pool Oasis, featuring two 200-foot waterslides, a 90-foot speed slide, kids splash park and nightly laser light show, or enjoy a round of 18 holes at our championship golf course and golf instruction at Jack Nicklaus Academy. Travelers can dine at our 10 restaurants and lounges, relax with a massage at the full-service spa, or take advantage of our state-of-the-art fitness center. An ideal choice for professional events or social celebrations, our conference resort boasts over 400,000 square feet of flexible space for meetings, conventions, weddings, receptions and charity soirees. At Orlando World Center Marriott, our world is yours. Sample delicious and creative Italian cuisine at Siro Urban Italian Kitchen, the Orlando World Center Marriott's contemporary and casual Italian restaurant. You'll love the funky d cor and our chef's innovative take on classic Italian dishes. For the best daily breakfast buffet in Orlando, FL, look no further than Solaris. Enjoy homestyle cooking for breakfast or lunch at this warm and welcoming restaurant. Sports fans and casual observers alike will love High Velocity, the Orlando World Center Marriott's combination sports bar/restaurant. Watch the big game on one of 27 flat-screen HDTVs and enjoy a selection of the best beers and bar fare in town. Boasting fantastic golf course views, Hawk's serves premium steaks and features a world-class wine list. Treat yourself to delicious food and even better views. Orlando, FL's best Japanese restaurant offers authentic Teppanyaki-style cusine, including fresh-made sushi; watch as expert chefs prepare it for you. It's the perfect location for both a romantic date or for celebrating a special occasion with family. Enjoy perfectly prepared Starbucks coffee beverages and pastries right here in our hotel lobby.